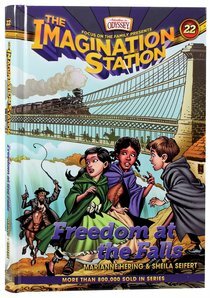 About "Freedom At the Falls (#22 in Adventures In Odyssey Imagination Station Series)"
:When they step into the Imagination Station, kids experience an unforgettable journey filled with action-packed adventure to inspire their imaginations. With each book, they're whisked away with cousins Patrick and Beth to embark on a new journey around the world and back in time. Marianne Hering, former editor of Focus on the Family Clubhouse magazine, has written hundreds of magazine articles, and numerous fiction books for children as well as the Tyndale published, Focus on the Family Clubhouse Activity Book. Currently, she is a freelance writer living in Colorado with her husband and three children. Sheila Seifert has more than one thousand freelance sales (fiction, nonfiction, poetry, and scripts) and teaches creative writing, composition, and literature classes at local colleges and universities. She has authored/coauthored fifteen books (seven fiction, six nonfiction, two books of skits) and two e-books. Her first script for an animated TV show will air on PBS in 2006. Sheila currently resides in Colorado with her husband and three children. Travel back in time and sail with the Vikings, meet a Roman Emperor, come face-to-face with China's Kublai Khan, and experience a host of other historical adventures in the Imagination Station series for young readers. This set includes the first three books in the Adventures In Odyssey series: "Voyage with the Vikings", "Attack at the Arena", and "Peril in the Palace".